Today I’m going to share with you my another haul post, about Patanjali beauty products which are my recent purchase. Before this haul I have tried two products from their wide range of skin care and hair care. I really liked the products which are comes at affordable prices. I bought some products from their skin care and hair care range. I will come with their detailed reviews soon. Claims: Strengthen the roots, prevents hair fall, prevents graying hair and split ends. Ingredients: sunflower oil, olive oil, sesame oil and amla oil. My Views: We all know that amla basically use for prevents graying hair and it is also good for hair growth. For this reason I bought this amla hair oil. Hope its helps to prevent my grey hair. Claims: Strengthens, Softens & Conditions the hair and prevent hair fall. 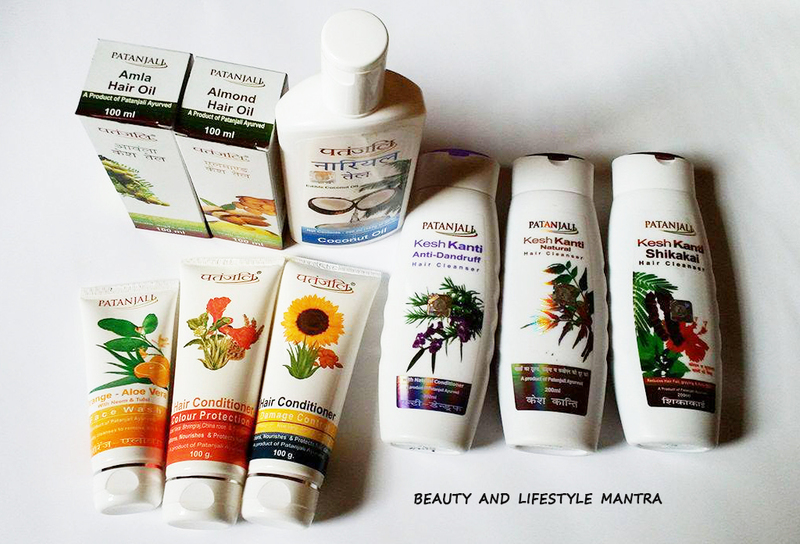 Ingredients: Sesame oil, Almond oil, Amla oil, Bahera etc. My Views: Almond oil is rich with minerals and vitamins which helps to keep hair health and nourished. 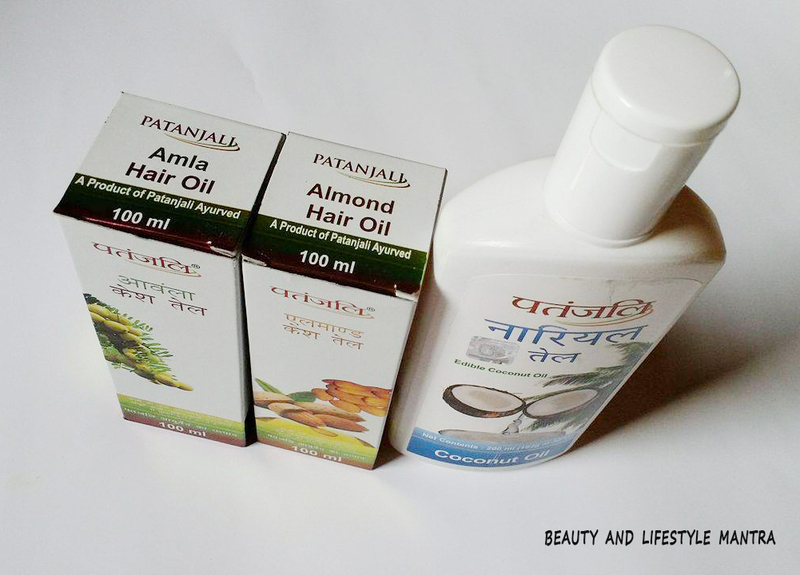 You need to use almond oil on a regular basis to control hair loss which is a big issue for every girl. So I think this oil could be prevent hair fall and make my hair roots strong. Claims: It is made from the fresh and mature coconuts. It has unique features like that of moisturizing and is a great hair conditioner, while treating the flakiness of the scalp that are caused by the dryness of the area or fungal infection. It reduces hair-fall and helps in the regrowth of damaged hair. Lastly, it is non-sticky and can be put to multiple uses as make-up remover, body oil, hydration for lips, etc. My Views: For my hair I always use parachute coconut hair oil. This is the first time I switch to Patanjali coconut oil. Coconut Oil is a great way to nourish my hair and make them easy to manage. It is a fine choice for everyday usage. 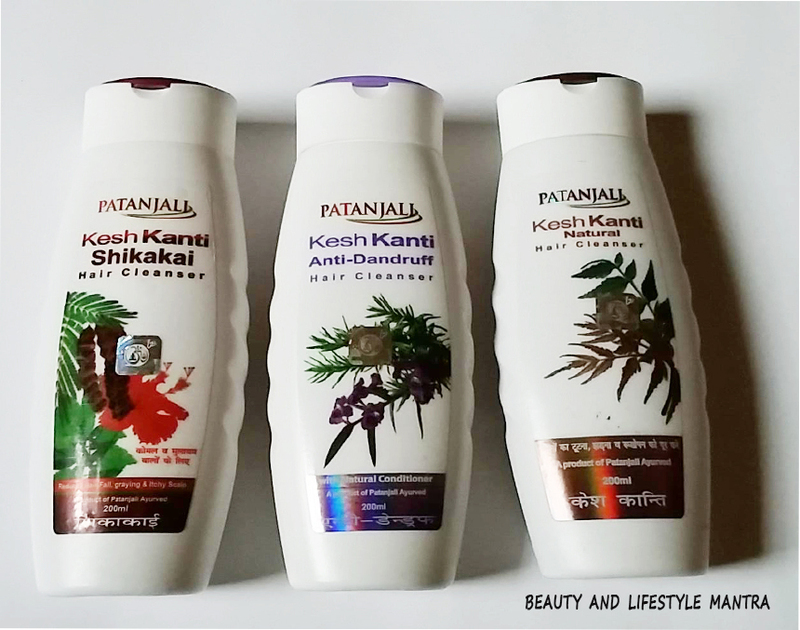 Claims: Patanjali kesh kanti shikakai hair cleanser is an herbal product made to help you reduce your hair fall, graying, prevents itchy scalp and makes the hair soft and silky. This shampoo come packed with the goodness of natural ingredients that give you best results. Ingredients: Shikakai, Bhringraj, Hibiscus rosa sinensis, Juglans regia etc. My Views: Shikakai works as a very mild cleanser for hair. I used several times shikakai powder which really adds shine to the hair and hair looks much health. So I hope this shampoo works same as what I experienced before with shikakai powder. Claims: Patanjali kesh Kanti Anti-dandruff Shampoo is a herbal Ayurveda shampoo that prevents hair loss & remove dandruff. It also removes dirt from hair and scalp. Ingredients: Neem oil, Tree tea oil, Acadia concinna (shikakai), Emblic myrobalan (amla), Soap nut (ritha), Indian valerian (tagar), esculent fiacurtia (bakuchi) etc. My Views: I already reviewed this shampoo. Read here . 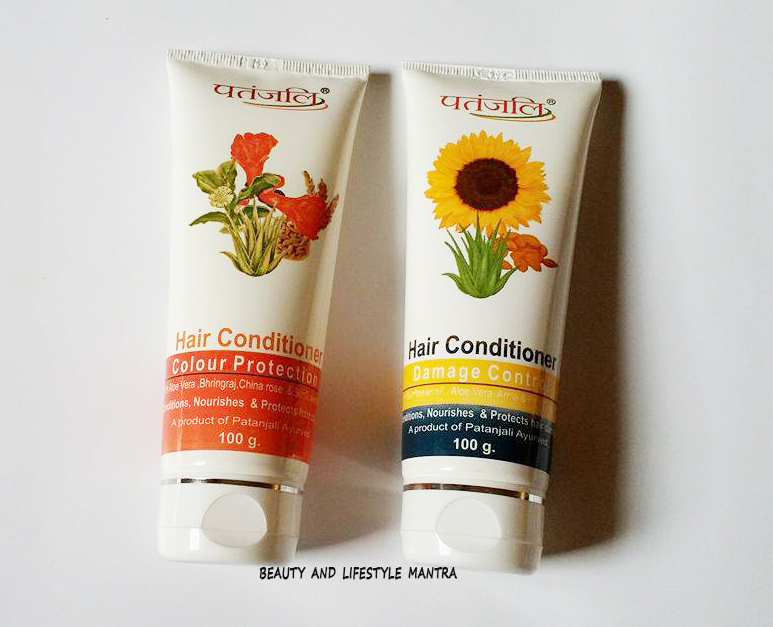 Claims: Kesh Kanti Shampoo is an Herbal Shampoo for Healthy and growing Hair. It treats Continuous Hair loss, Dandruff problem, itching of the scalp, Split ends, rough and dry Hair, under grown Hair length, Baldness etc.This Shampoo is the natural remedy for Hair problems. This is the best natural shampoo for the treatment of all the problems with its roots and helps to give a shiny look to the Hair. Ingredients: Soap nut (ritha), margosa (neem), Amla, Henna, Shikakai Indian valerian (tagar), esculent fiacurtia (bakuchi) and turmeric etc. My Views: Like other two shampoos this one is also listed with natural ingredients. I think it will also nourishes my hair from root to tip. And makes hair look soft and smooth. Claims: Useful in dryness, roughness of hair. It provides conditioning for dry and damage hair. Regenerates hair growth and make hair healthy and strong. Ingredients: Base material: Aqua, shea butter, glycerine, vit-E, silicon quanternium, diazolidinyl urea and IPBC, permitted colour and sugandhit dravya-Q.S. My Views: I hope it will make my Hair soft and controls frizzy dry ends well. Claims: Damage Control Hair Conditioner is useful in dryness and roughness of hair. It provides conditioning for dry & damaged hair.Regenerates hair growth and make hair healthy and strong. It also fights dandruff, prevents graying of hair and split ends. Ingredients: Aloe vera juice, Sunflower oil, hempseed oil, almond oil, wheat germ oil, bhringraj extract and amla seed oil. My Views: I picked this Damage Control Hair Conditioner for regular use. I hope it will work as it claims. 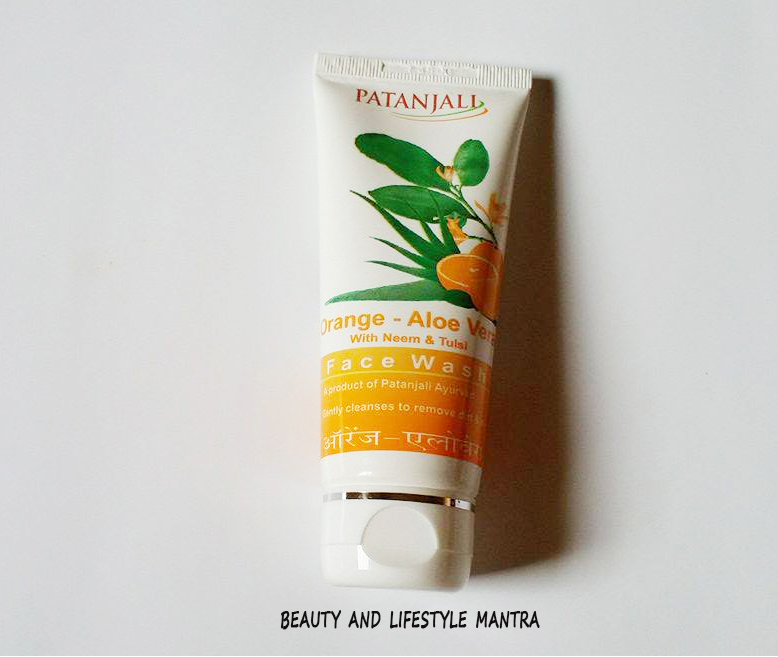 Claims: The Patanjali Face Wash has pure natural ingredients like orange and aloe that has healing properties. It is a pure herbal face wash and is ideal for all skin types. My Views: I bought this face wash mainly for its Ayurvedic ingredients. Above ingredients are to make complexion fresh, smooth and beautiful. It also helps to prevent pimples. So, this is my huge hair care haul for this month. Please share your thought if you have used any of these products. Hopefully these products will do me fair only. great informative patanjali blog,thanks for this. Here is a great “ buy 1 get 1 free ” offer from Argan Rain!